Suspicions of foul play have mounted over the crash of an EgyptAir passenger jet yesterday, as search teams were reported to have begun locating debris in the Mediterranean Sea. Greek media reports said aircraft debris, including pieces of plastic and life vests, were found floating in the sea about 370km south of the island of Crete. 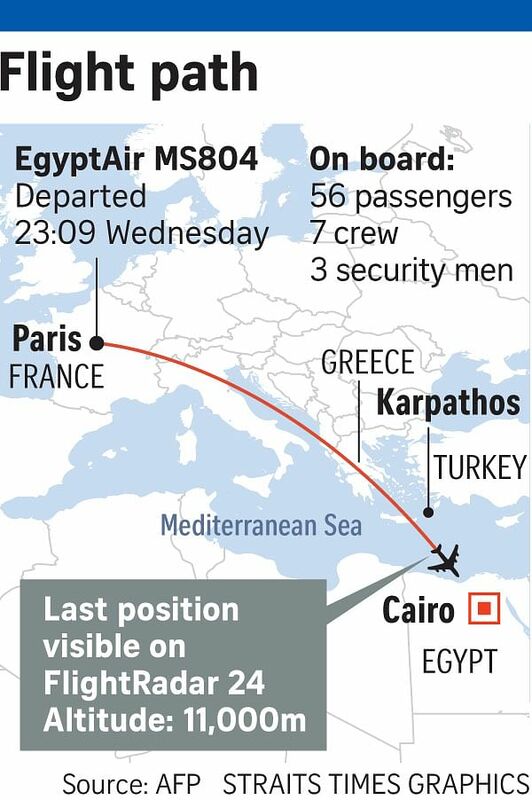 Flight MS804, which left Charles de Gaulle Airport in Paris on Wednesday at 9.09pm GMT (5.09am Singapore time yesterday) for Cairo with 66 people on board, did not make any distress call before it went down. A picture of sudden disruption emerges as the authorities pieced together the final moments of the aircraft. The Greek aviation authorities said all appeared normal when the plane entered Greek airspace and air traffic controllers made their last contact with the EgyptAir pilot who was "in good spirits". Greek air traffic control contacted the pilot again, just before the plane was due to be handed over to Egyptian air traffic control, but "the aircraft did not respond". Shortly thereafter, all radar contact with the plane was lost in Egyptian airspace, 280km off the Egyptian coast. Greek Defence Minister Panos Kammenos said it had made swerves of 90 degrees to the left and then 360 degrees to the right, before plunging and going missing. The Airbus A-320, which went into service in 2003, was carrying 30 Egyptians, 15 French, two Iraqis, and one each from Canada, Britain, Belgium, Kuwait, Saudi Arabia, Algeria, Sudan, Chad and Portugal. It also had seven crew members and three security personnel on board. Egypt's Civil Aviation Minister Sherif Fathy said he was ruling out neither terrorism nor mechanical failure, but acknowledged that terrorism was a "higher possibility". Many experts concurred, saying mid-air emergencies were rare, especially for a relatively new plane. They also noted the weather was good at the time the jet went down. Anxious family members have converged at the Cairo and Charles de Gaulle airports to wait for news, while Greek and Egyptian search teams combing for debris off the Greek island of Karpathos, northeast of Crete, expanded their operation. France, Britain and the United States have also offered to help in the search efforts. If the plane is located, salvage will focus on retrieving the flight and data recorders, the so-called black boxes that store key flight information which can help investigators pinpoint the cause of a crash. But finding a plane after an incident, particularly over water, can typically take hours, if not days. Meanwhile, French police have started investigating Charles de Gaulle Airport's ground crew, reported French newspaper Le Figaro. Since the beginning of last year, nearly 70 employees who had access to the most secure areas of Paris' airports have had their security clearance revoked, reported the paper. Egypt also has had to deal with a series of aviation disasters in recent months. Last October, a Russian airliner en route from Sharm-el- Sheikh to St Petersburg crashed soon after take-off, killing 224 people. The Islamic State in Iraq and Syria claimed it bombed the plane. In March this year, an EgyptAir flight was hijacked by a man who claimed to be wearing an explosive belt, which turned out to be a fake.